A Certain Scientific Accelerator is an ongoing series that features colour inserts in each volume. The "Certain" franchise began with the long-running light novel series A Certain Magical Index, which was adapted into both a manga and an anime series. Its spin-off, A Certain Scientific Railgun, became a breakout hit. Welcome to a world where mysticism and science collide, and supernatural powers are derived from either science or religion. At the heart of this world is Academy City, an advanced metropolis whose population is comprised mostly of students. The majority of students are enrolled in the city's "Power Curriculum Program," where they must learn to master their latent psychic powers. A Certain Scientific Accelerator is an ongoing series that features color inserts in each volume. 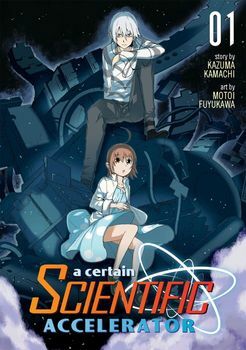 The "Certain" franchise began with the long-running light novel series A Certain Magical Index, which was adapted into both a manga and an anime series. Its spin-off, A Certain Scientific Railgun, became a breakout hit. Welcome to a world where mysticism and science collide, and supernatural powers are derived from either science or religion. At the heart of this world is Academy City, an advanced metropolis whose population is comprised mostly of students. The majority of students are enrolled in the city's "Power Curriculum Program," where they must learn to master their latent psychic powers.